Harvey Pekar, hospital file clerk and comic book creator was found dead yesterday. Pekar is best known for his American Splendor series, but he also wrote one of the most gripping accounts of cancer I’ve ever read – the autobiographical Our Cancer Year. Thus starts the story of 1990, the year of the Gulf War and the year Harvey Pekar discovered he had lymphoma. Written by Pekar and his wife Joyce Brabner and illustrated by Frank Stack, the book is an honest account of the couples battle with cancer, chronicling everything from denial, through resignation and finally beating the disease. Their battle against cancer is contrasted with the Gulf War, as Brabner finds several of her Middle Eastern friends affected by the conflict. Often grumpy and always acerbic, Pekar wrote about his own life and the lives of people he knew in his comics. Out Cancer Year is perhaps where he exposes his vulnerability the most, and the very human story shines through his surliness. Harvey and Joyce get the bad news in a bad way. Click to enlarge. 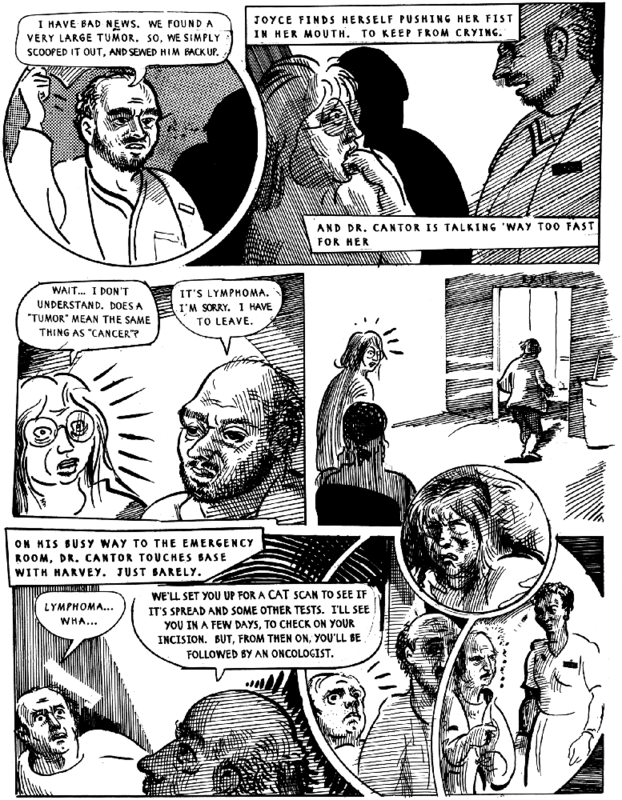 You are currently reading Harvey Pekar’s Cancer Year at The Sterile Eye.